We’d love your help. Let us know what’s wrong with this preview of Roots Demystified by Robert Kourik. To ask other readers questions about Roots Demystified, please sign up. I like garden books - especially when they have actual references and experience to back up the statements. I got a few good tips and a good bit of inspiration. There was something about the cover that made me not ever buy it (shallow, I know), but my son bought it and lent it to me. Glad he did. And now I even like the cover better. Another cover turn off and an excellent read is Dear Mad’m by Stella Patterson (I think). Robert Kourik became curious about roots one day and discovered that some pioneering scientists (John Weaver and V.A. Kolesnikov) had done some great work on them (unsurprisingly). In "Roots Demystified," he extrapolates gardening advice from this scientific background. While much of the advice seems sound (drip irrigation and no-till gardening are great), the premise of the book seems stretched a little thin for me. There is some interesting knowledge to be had in the book. I was especially fas Robert Kourik became curious about roots one day and discovered that some pioneering scientists (John Weaver and V.A. Kolesnikov) had done some great work on them (unsurprisingly). 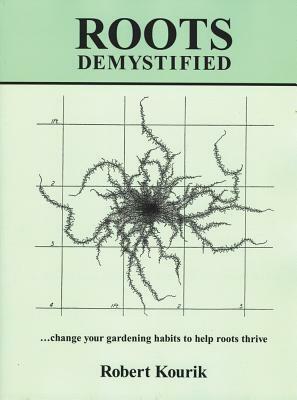 In "Roots Demystified," he extrapolates gardening advice from this scientific background. While much of the advice seems sound (drip irrigation and no-till gardening are great), the premise of the book seems stretched a little thin for me. There is some interesting knowledge to be had in the book. I was especially fascinated by the phenomenon of hydraulic lift (http://en.wikipedia.org/wiki/Hydrauli...), which I'd never known about before. This book was helpful and contained some surprising information about roots. I think it was more helpful in understanding how tree roots grow, but there is some relevant information for vegetable gardeners. I wasn't a thrilled with it as I hoped to be from reading the reviews, but it is certainly valuable knowledge for anyone wanting to delve a little deeper into understanding how plants grow and thrive. I love this book. The drawings of root systems are fascinating. You're reading a book about roots? yes and it is great. Who knew roots could be so interesting! Since we depend on them to sustain us reading about them seemed a good thing to do.